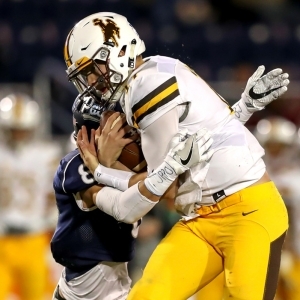 The Wyoming Cowboys travel to Falcon Stadium to take on the Air Force Falcons on Saturday, November 11, 2017. The opening line for this game has Air Force as 3 point favorites. The Cowboys have an ATS record of 6-3-0 while their over/under record is 2-7-0. The Falcons have an over/under record of 6-3-0 and they are 4-5-0 against the spread. 11/04/17 CB Deandre Watson Undisclosed is "?" 11/04/17 OL Ryan Cummings Illness is "?" 11/04/17 DE Shiloh Windsor Concussion is "?" 11/04/17 LB Matt Evans Shoulder is "?" 11/04/17 RB Parker Wilson Undisclosed is "?" The Wyoming Cowboys are 98th in Division 1 in points scored with 216. They have run 533 plays this season for 2,549 yards, which ranks them 103rd in the nation in total offense. The Cowboys average 4.8 yards per play, which is 122nd in college football. As a team they have accumulated a total of 139 1st downs this year, placing them 124th overall as an offensive unit. On the ground Wyoming has run for 929 yards as a team, which ranks 124th in the country. They've run 290 times, averaging 3.2 yards per carry as a rushing unit. The Cowboys have been penalized on offense 38 times for 373 yards so far this season, which has them 119th in the nation in penalties. Josh Allen has thrown for 1,588 yards this season. He has completed 133 passes on 240 attempts for a completion percentage of 55.4%. His quarterback rating this year is 122.5. He averages 6.6 yards per pass attempt and 6.5 adjusted yards per throw. Wyoming is 20th in the nation in points allowed on defense with 167. They have surrendered a total of 2,963 yards on D, which is 28th in Division 1. The Cowboys are ranked 13th in yards per play allowed with 4.6. Opposing offenses have completed 124 passes on 217 attempts against the Wyoming Cowboys defense this season, placing them 10th and 7th in the country. The Wyoming pass defense has also given up a total of 1,393 yards through the air, which is 5th overall in total pass defense. Their rushing defense has allowed 423 attempts for 1,570 yards this year, putting them in 75th place in D-1 against the run. The Cowboys have committed 42 penalties for 396 yards on the defensive side of the ball this season. That ranks them 32nd in the nation. Wyoming is ranked 46th in the nation in punt returns with 15. They've accumulated 159 punt return yards and average 10.6 yards per return, which is 32nd in college football. They have returned 16 kicks for 476 yards on special teams, ranking 74th in kick return yardage. The Cowboys average 30 yards per kick return and they are 126th in the country in all-purpose yards with 3,184. The Wyoming Cowboys have attempted 13 field goals this season and made 11, which is 60th in D-1. Their kickers have a field goal percentage of 85%. Wyoming Cowboys kickers have made 96% of their extra points, going 25 for 26 this year. Their punters have totaled 2,119 yards on 55 punts, averaging 39 yards per punt. That places them 120th in Division 1 in punting average. The Falcons have run for 2,878 yards as a team, which ranks 4th in the nation. They've run 570 times, averaging 5 yards per rush as a unit. The Falcons have been penalized on offense 35 times for 337 yards so far this year, which has them 124th in the country in penalties. They are 33rd in Division 1 in points scored with 306. They have run 665 plays this year for 3,876 yards, which ranks them 124th in the nation in total offense. The Air Force Falcons average 5.8 yards per play, which is 53rd in college football. As a team they have accumulated a total of 222 1st downs this season, ranking them 13th overall as an offensive unit. Arion Worthman has completed 44 throws while attempting 87 passes for a completion percentage of 50.6%. He has passed for 925 yards this year. He averages 11.1 adjusted yards per throw and 10.6 yards per pass attempt. His quarterback rating this season is 167.1. The Air Force Falcons rush defense has given up 350 attempts for 2,247 yards this season, putting them in 125th place in the country against the run. They have had 31 penalties for 287 yards on defense this year. That places them 3rd in Division 1. Air Force is 97th in college football in points surrendered on defense with 282. They have given up a total of 3,549 yards on D, which is 66th in the nation. The Falcons are 122nd in yards per play allowed with 6.8. Opponent offenses have completed 89 throws on 172 attempts against the Air Force defense this season, ranking them 1st and 1st in the country. The Air Force Falcons pass defense has also surrendered a total of 1,302 yards in the air, which is 2nd overall in total pass defense. The Air Force Falcons have tried 10 field goals this year and made 7, which is 101st in college football. Their kickers have a field goal percentage of 70%. Air Force kickers have made 97% of their extra points, going 37 for 38 this season. Their punters have accumulated 1,219 yards on 29 punts, averaging 42 yards per punt. That ranks them 64th in the NCAA in punting average. Air Force is 103rd in the country in punt returns with 9. They've totaled 56 punt return yards and average 6.2 yards per return, which is 77th in D-1. They have returned 18 kicks for 326 yards on special teams, which puts them 119th in kick return yardage. The Falcons average 18 yards per kick return and they are 63rd in the nation in all-purpose yards with 4,258.
Who will win tonight's Cowboys/Falcons college football game against the spread?